What makes the all-new Ford Escape such a popular crossover? All you need to do is take one look at the countless technology features to understand all the buzz. 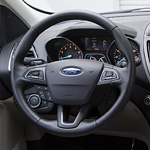 One of the features in the Ford Escape that many drivers are raving about is the Lane-Keeping System. The way this feature works is the radar in the car detects if the vehicle is slowly easing over the lane lines without use of the turn signals. If this is the case, the steering wheel begins to vibrate to alert the driver to take action. The Ford Escape also comes with Forward Collision Warning with Brake Support. This feature works when cruise control is on, scanning the road ahead for slower moving vehicles and slowing down the vehicle until it is clear to move on. Stop by West Herr Ford of Amherst so you can see these technology features in action when getting the Ford Escape out for a test drive.